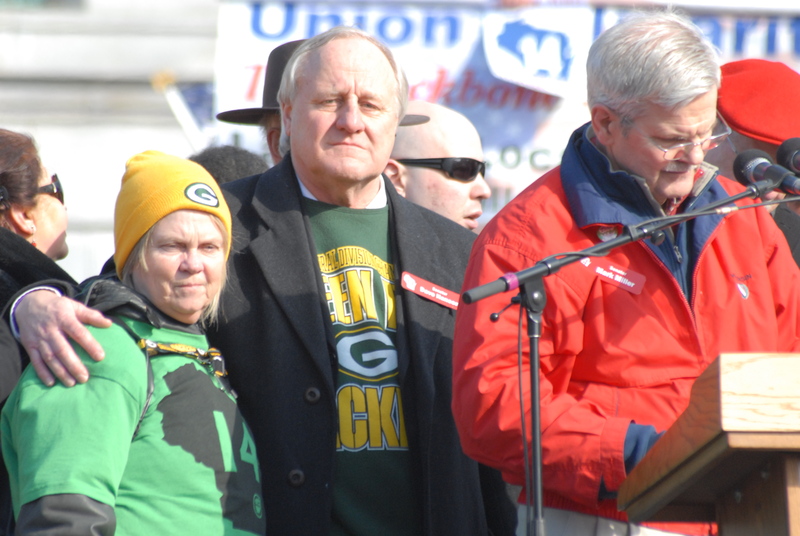 Friday, March 25, 2011–Hibbing, Minn. 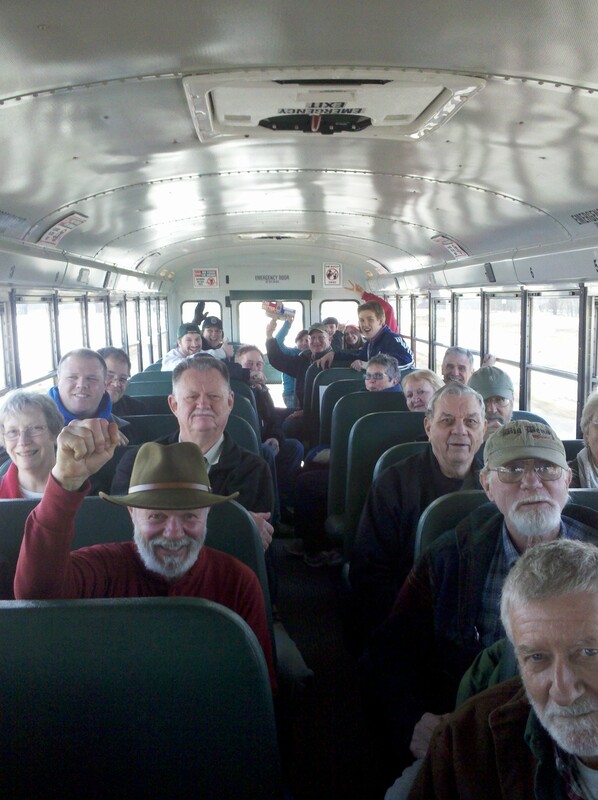 THE BOYS (AND GIRLS) ON THE BUS--These West Mesabi Iron Rangers traveled from Grand Rapids to Hibbing for a labor rally--passing through my hometown of Pengilly which is halfway between. 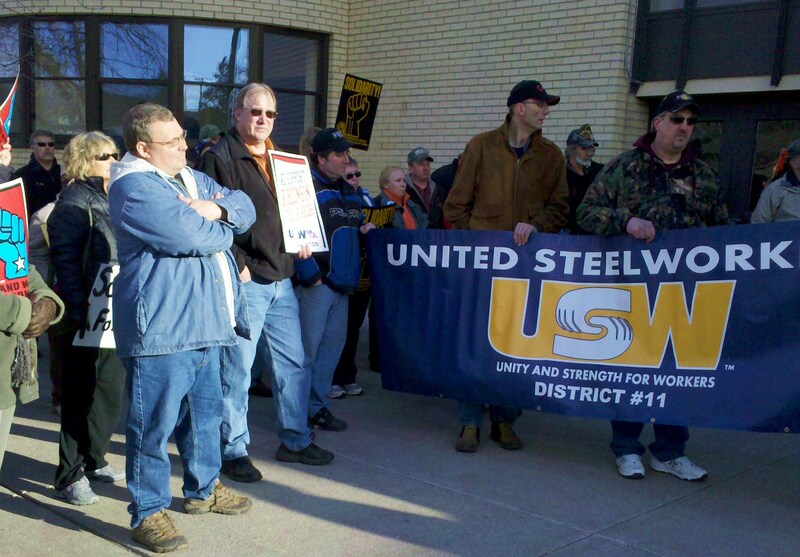 I was indeed proud of my homies from the Range last Friday night when about 300 concerned workers, union members and their families turned out for an Iron Range Solidarity Rally at the Memorial Building in Hibbing–the proud hometown of the late Governor Rudy Perpich, Bob Dylan and the World’s Largest Active Open Pit Iron Mine. 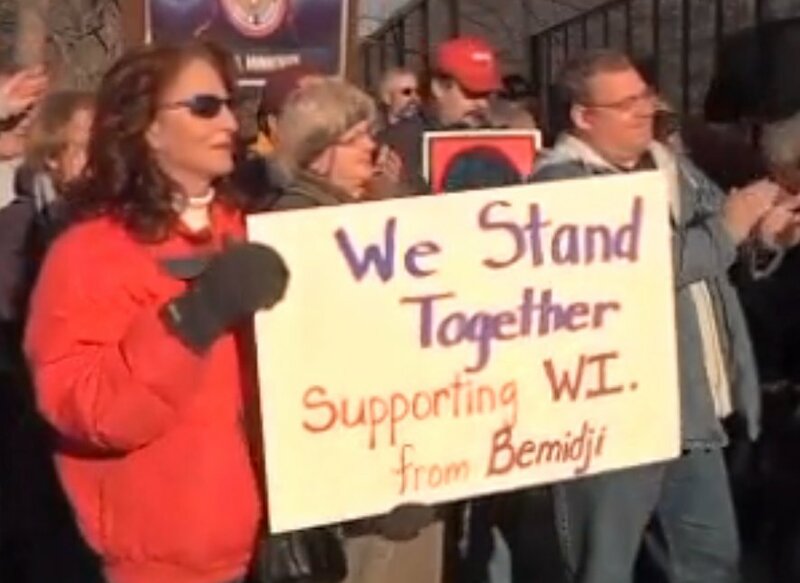 Other commitments kept me from driving over to Grand Rapids and joining a busload of Itasca County DFLers who drove across the Mesabi Iron Range to the rally. A couple of my friends brought me there in spirit. 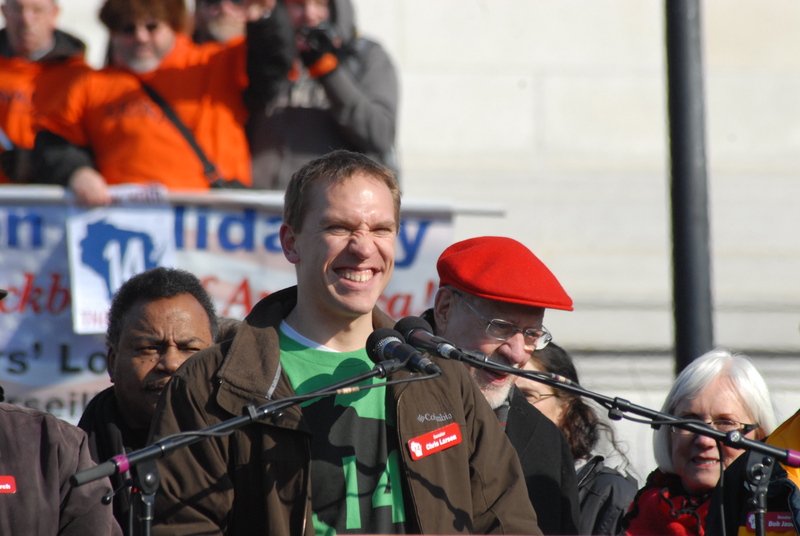 Joe Gould, a young DFL activist and City Councilman from LaPrairie sent me photographs that were taken by another friend, Pam Mcrory. 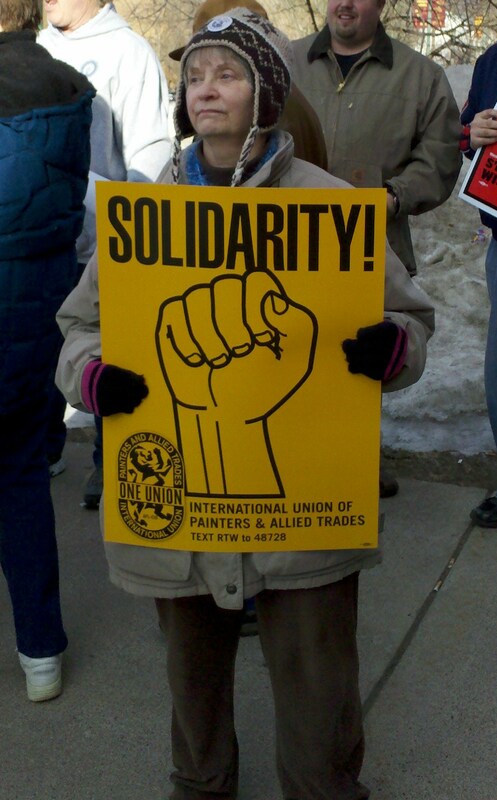 Mike Simpkins a Beltrami County DFLer from Bemidji and member of the Laborer’s International Union of North America filled me in with some details by phone. 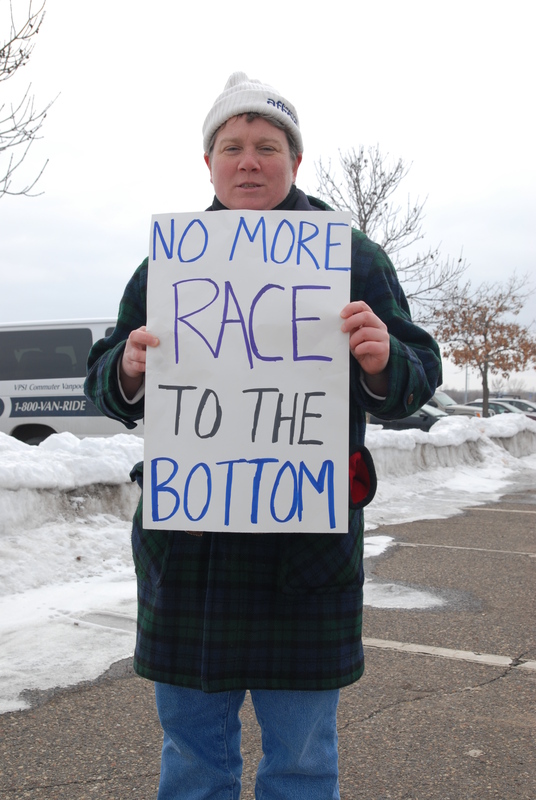 Pam is another great DFLer from Beltrami who lives in Bemidji. 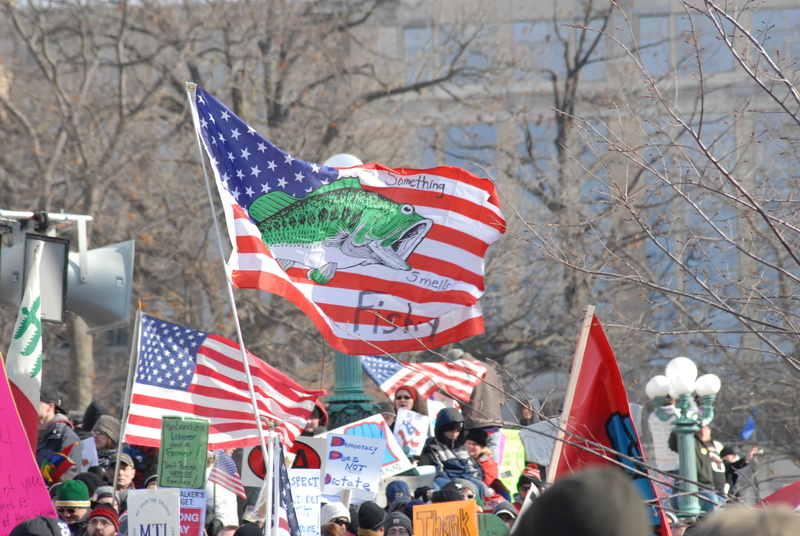 Mike Simpkins, a Laborer from Bemidji and Mike Sundeen, a Painter from Carlton County showed their colors. 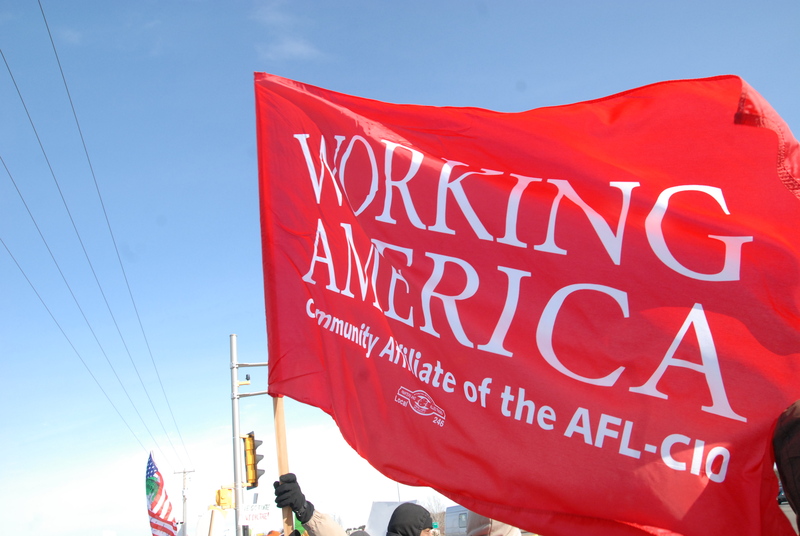 United Steelworkers of America proudly display their banner. 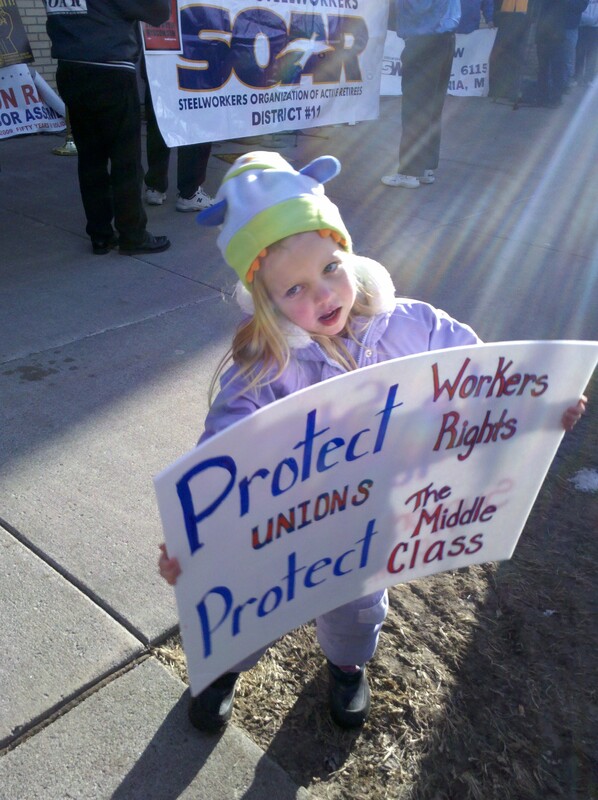 Jayci supports working families. 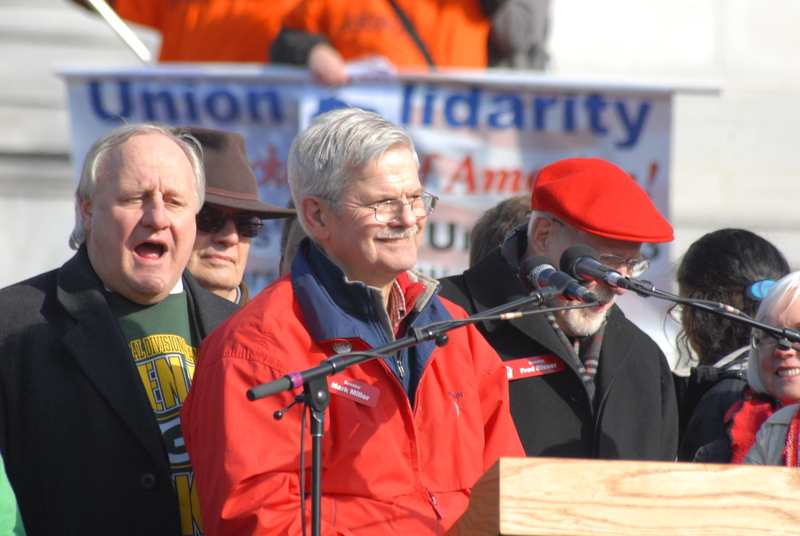 That should be no surprise since her grandpa is John Rebrovich, USW staff representative for District 11 and a life-long supporter of unions and the DFL. 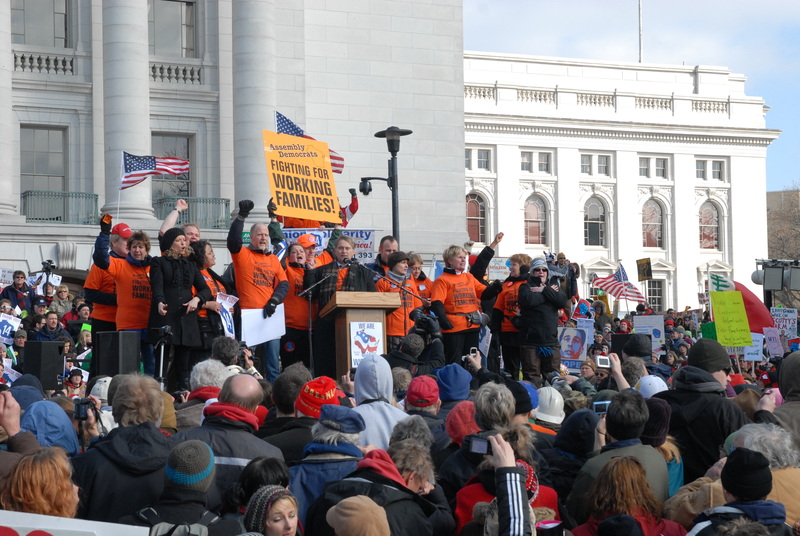 Iron Range icon, card-carrying Steelworker, and DFL State Rep. Tommy Rukavina (left) peaks out from behind a rally placard. Screen shot of Pam McCrory from the TV news. 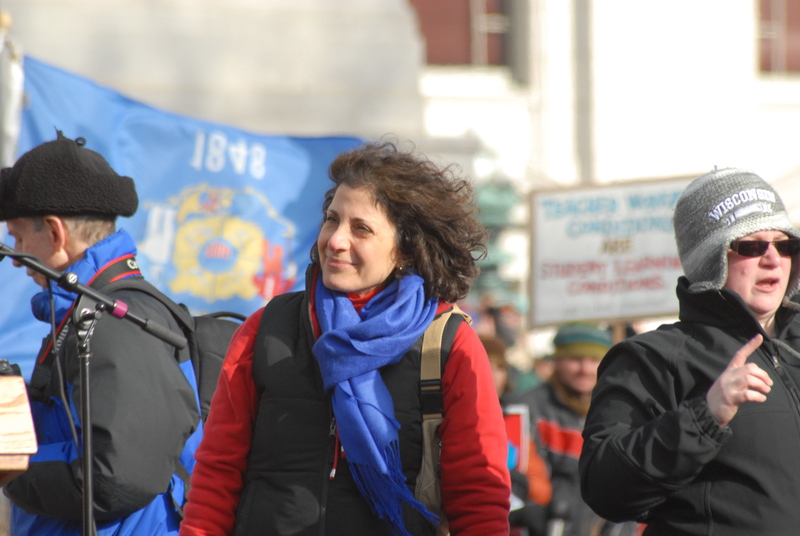 Colleen Nardone (right) is a long-time DFLer from Grand Rapids and a member of the DFL Women's Hall of Fame. 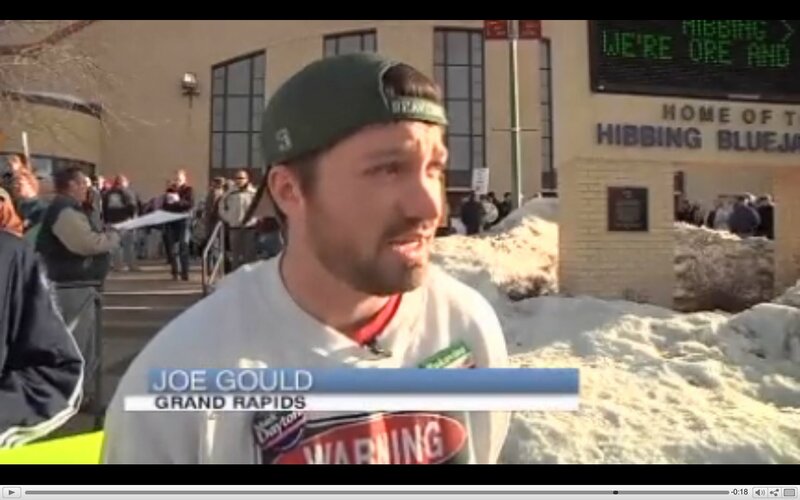 Screen shot of Joe Gould from the TV news. See link to news story and video below. For a story and news video, click this link. 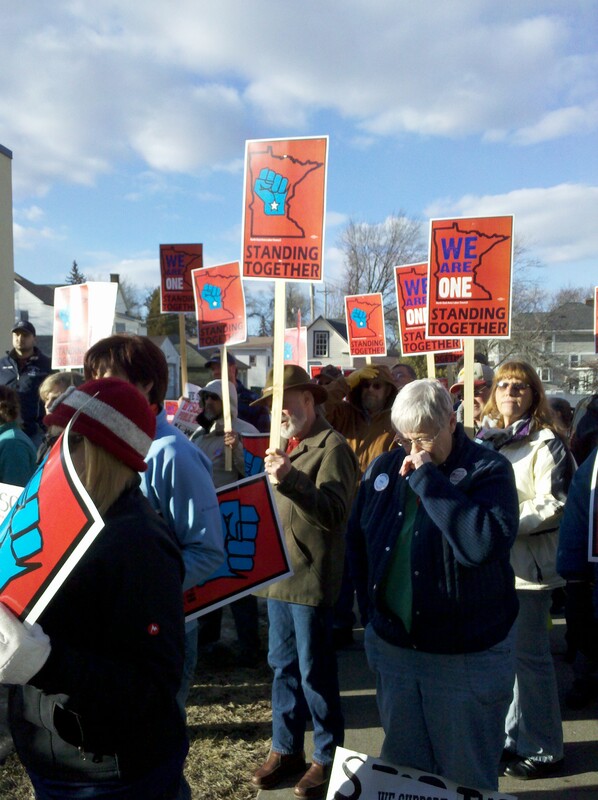 We are one on the Mesabi Iron Range in Minnesota! 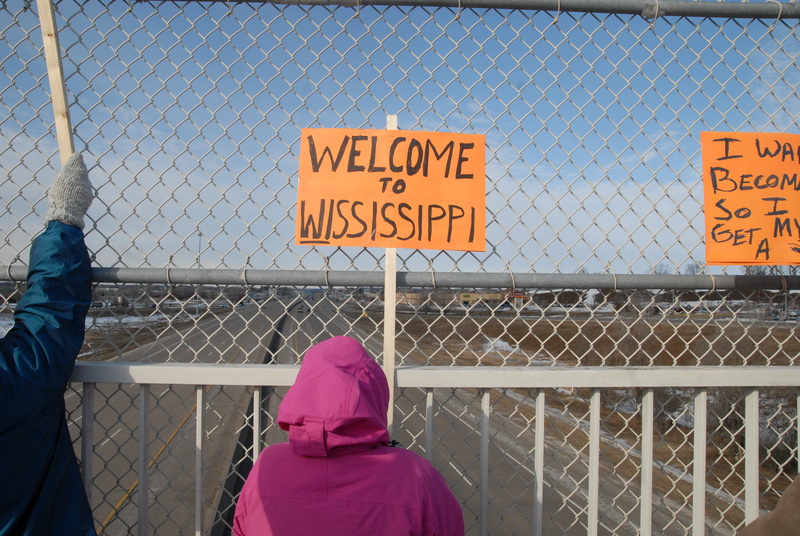 March 22, 2011-Detroit Lakes, Minn.
Bridge over Interstate 94--entering Wisconsin from Minnesota. 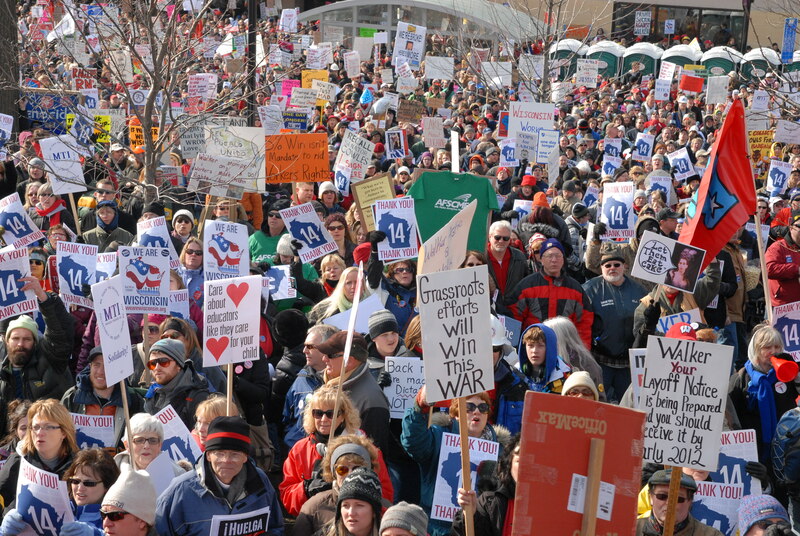 There are hundreds of photographs from rallies in Indianapolis and Madison posted on this ON THE ROAD…WARFARE ZONES OF THE MIDWEST blog. Several readers and viewers have contacted me regarding personal use of these photographs as well as use of my photographs for publication. 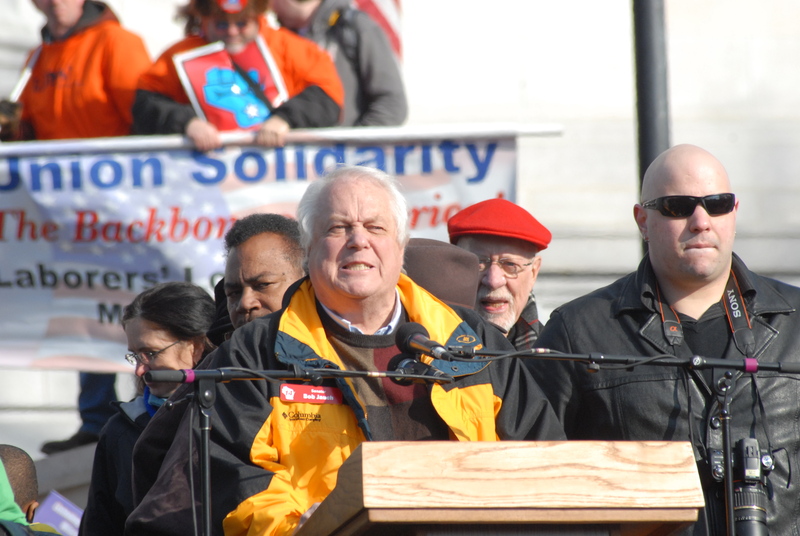 Union Brother Mark Froemke has been my traveling partner on this trip. 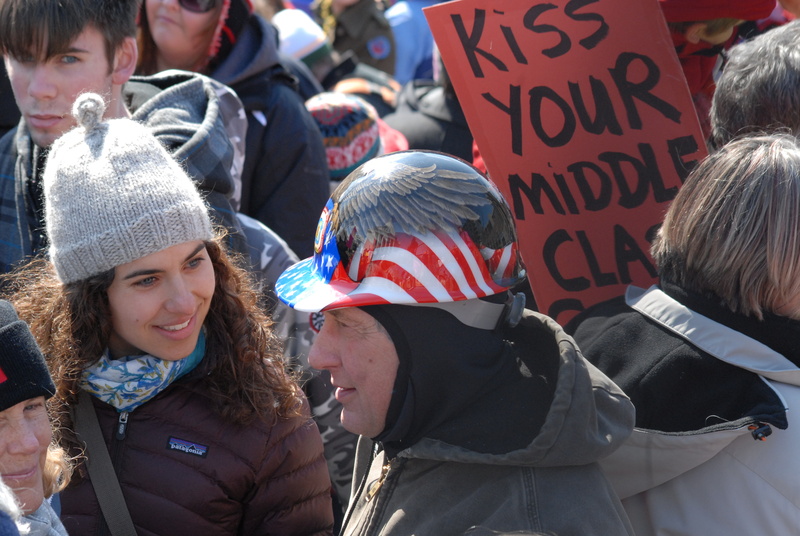 Mark and I have decided that this blog is our contribution to the working family class warfare struggle that is currently taking place across America. The photogs are free, but of course, if you feel the need to buy any of these photogs, feel free to contact me and we will figure out how you do that by paypal or get a check to me. Meanwhile, if you enjoy the blog, enjoy the photographs. enjoy the stories–spread the word around to your co-workers, members, friends and family. 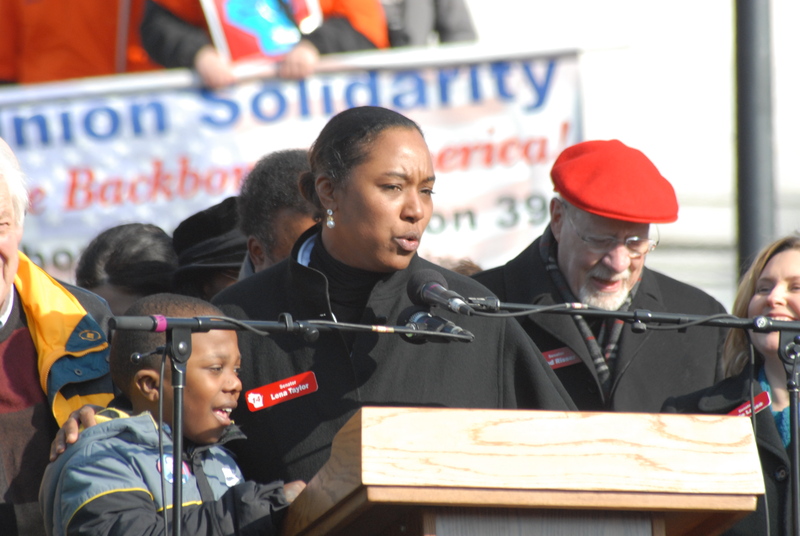 Working families will prevail at the ballot box! 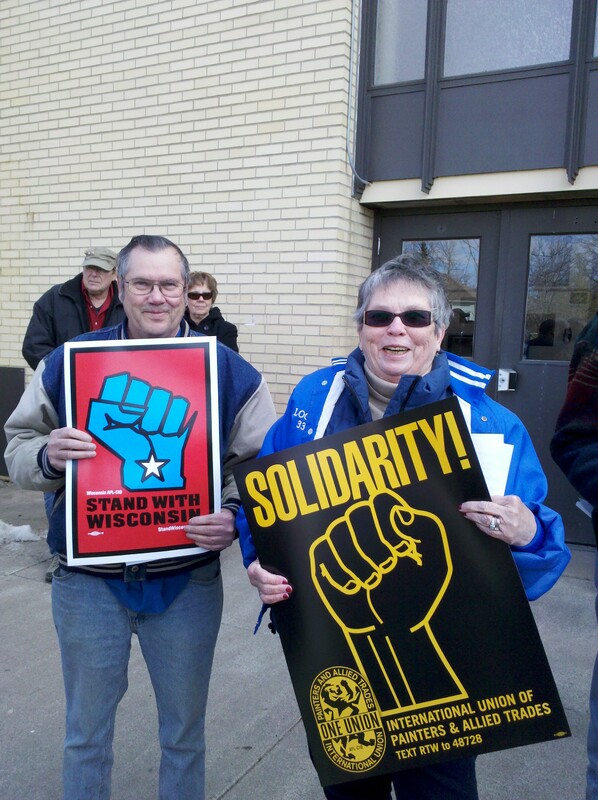 Mark Froemke and I wheeled into the Park and Ride lot near the bridge over I-94 in Hudson, Wis. a little after 3 p.m. A visibility picket was just winding down and Candace Lund, Minnesota AFL-CIO Mobilizing and Organizing Director was busy wrapping things up. 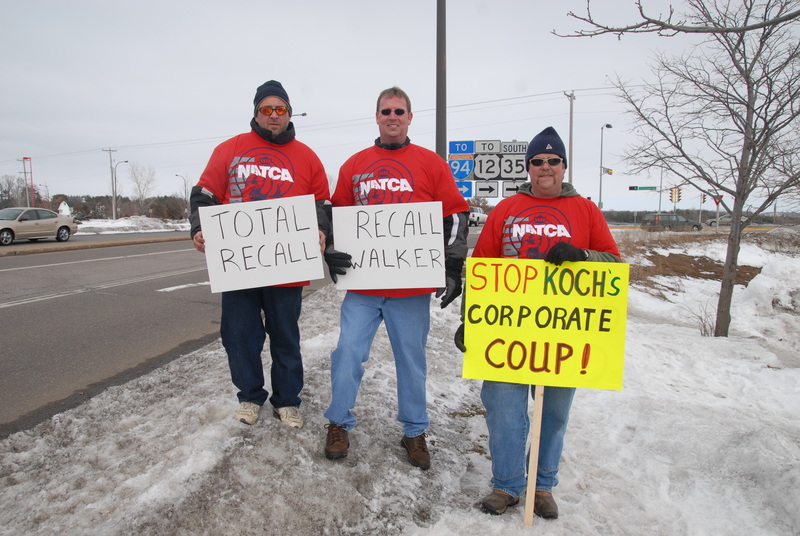 The visibility picket message was mainly on the recall to keep people stirred up about Walker, but more importantly, to aid in the recall efforts on Republican Senator Sheila Harsdorf. 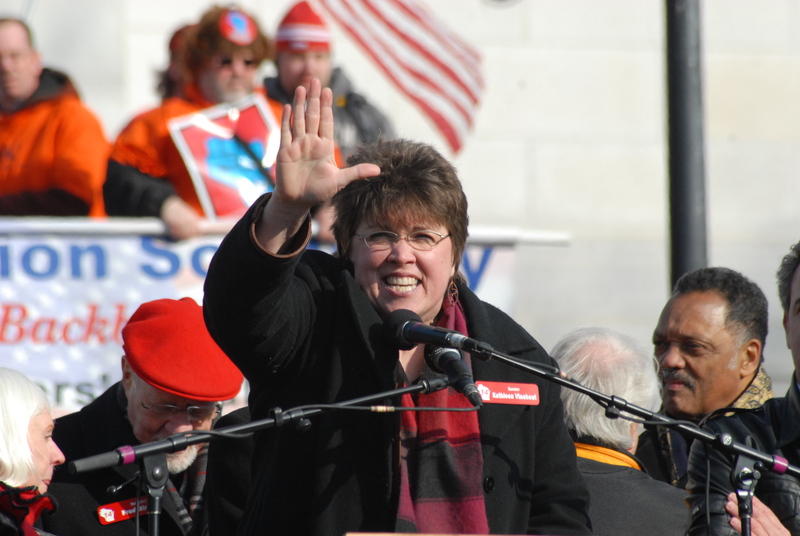 Harsdorf’s district includes Hudson, bucks right up to the Minnesota border, and requires 15,744 petition signatures in order to recall her. A goal that was not too lofty, Candace told Jerry Ockerenfels, Froemke and me. 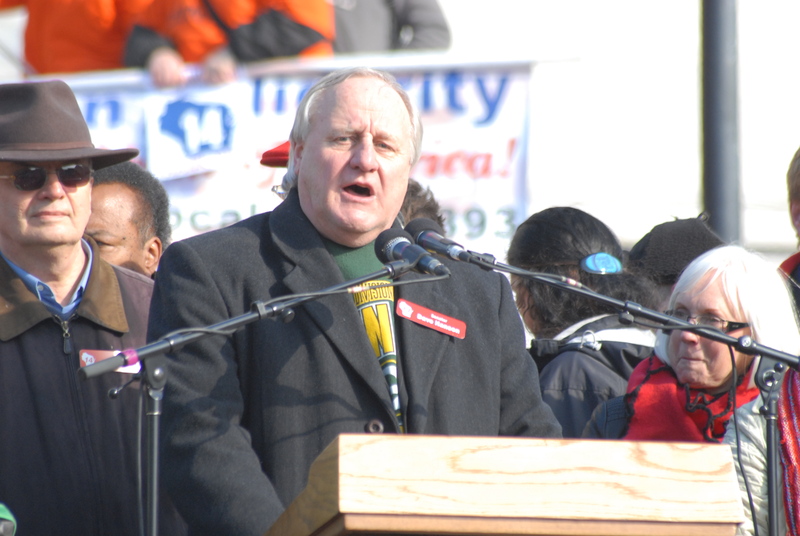 Ockerenfels is the Financial Secretary/Business Agent for the Bakery, Confectionary and Tobacco Workers and Grain Millers Union Local 22. Mark Froemke and Jerry Ockenfels—both members of the BCTGM—converse with ‘Zing Director Candace Lund. 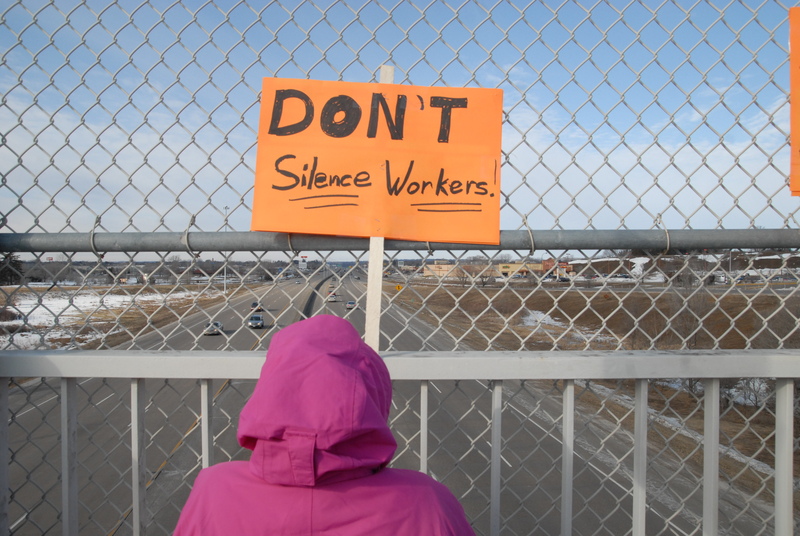 Over by the bridge, three members of the National Air Traffic Controller Association (Local ZMP out of Farmington, Minn.) were still picketing so I went up there to talk to them. 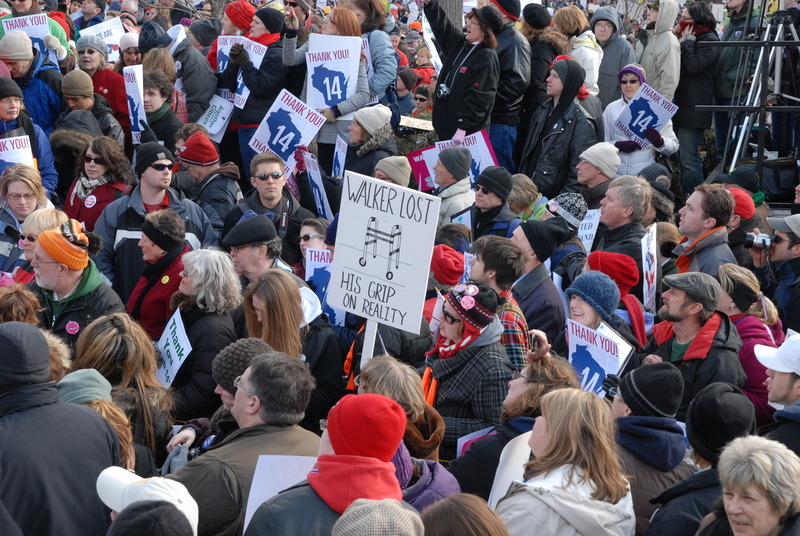 It was fitting that these activists were helping out our Wisconsin labor neighbors. 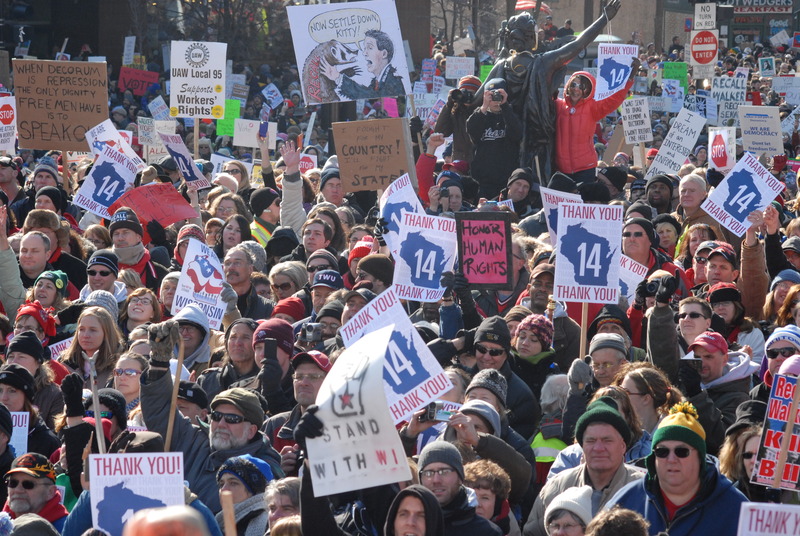 Not too long ago, Ronald Reagan was busting unions and firing the PATCO boys. Ethan Piche,Craig Boehne and Larry Nuorala are members of NATCA Local ZMP. 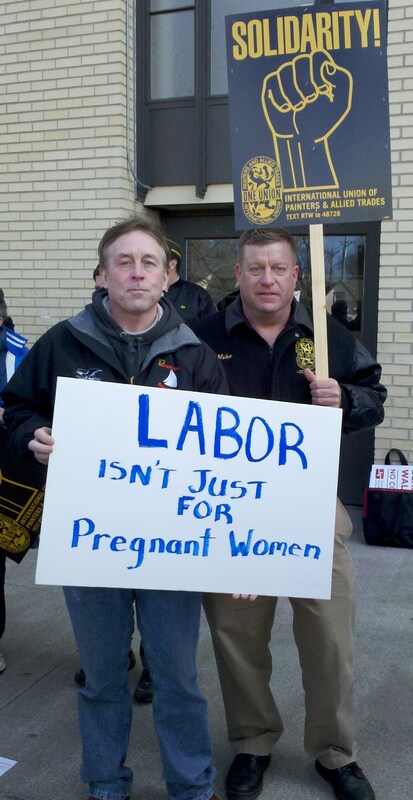 The three union brothers picketed at a rally in Hudson, Wis. last Sunday. 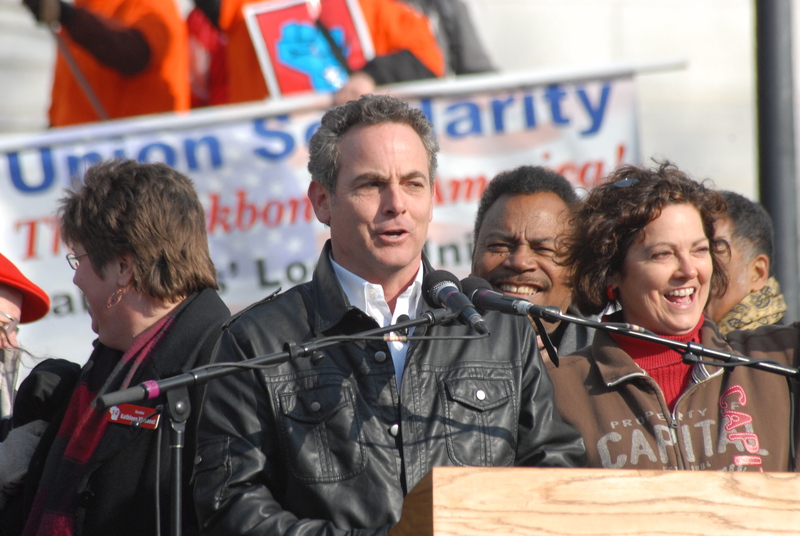 It was also fitting that Mark and I ended our rallying for this trip in the first working family class warfare zone that we started in—the bridge over I-94 in Hudson. 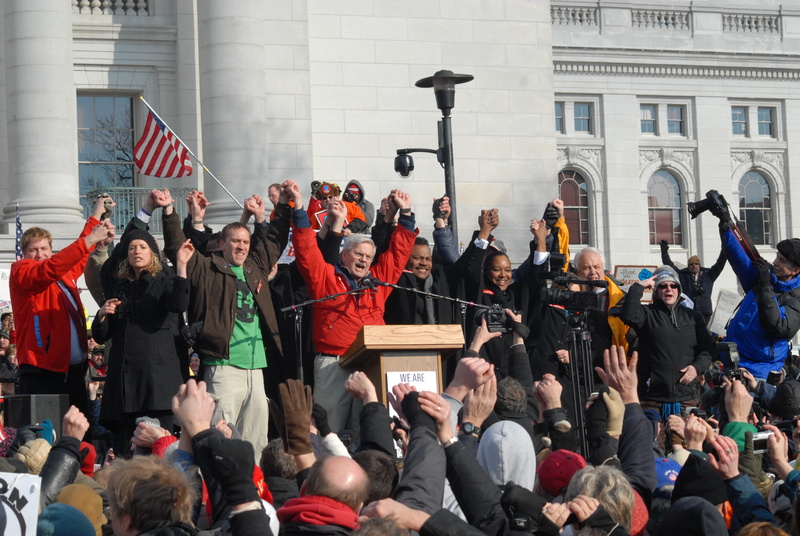 This is Part II of my photo features on the return of Wisconsin’s 14 Democratic State Senators to Madison. 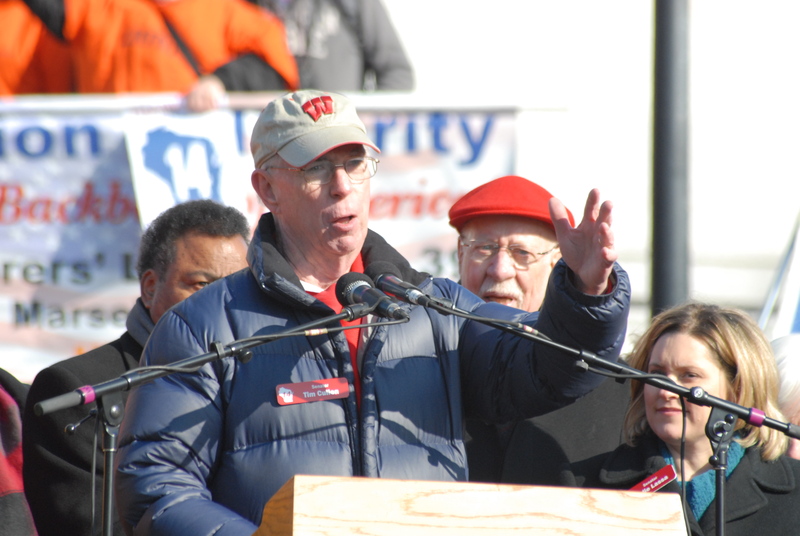 Democratic State Senate Minority Leader, Monona's Mark Miller, paused to soak up the crowd and the Saturday sun while his colleague, Senator Spencer Coggs gives a close-fisted salute to over 100,000 working people who cheered the heroes home. 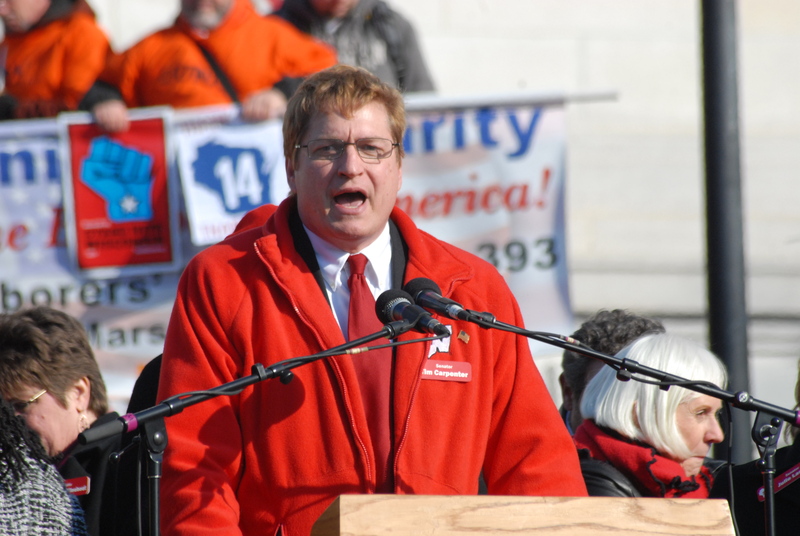 "Greetings from northern Wisconsin," said the Democrat from Conover, Senator Jim Holperin. "Thank you for being loud! Thank you for being peaceful." 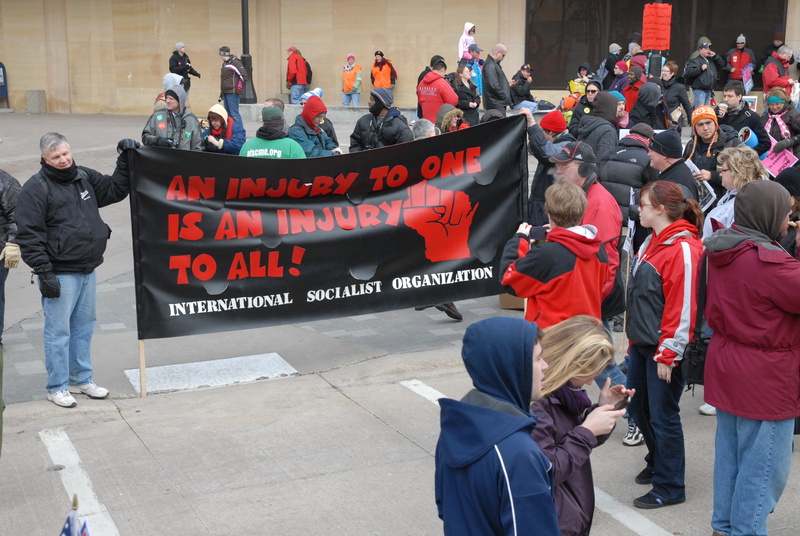 Wisconsin's Fab 14 in a show of unity. 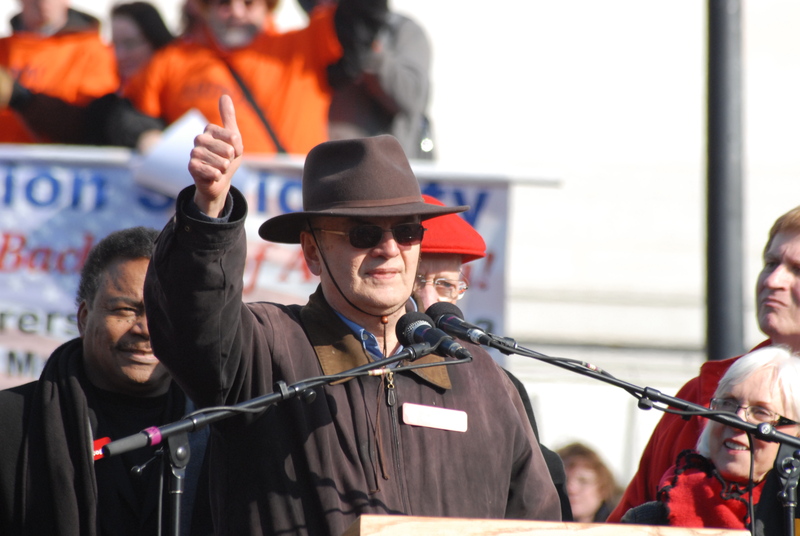 Senator Bob Wirch, a Democrat from Pleasant Prairie, gives a thumbs up to the crowd. THANK YOU! 14 THANK YOU! 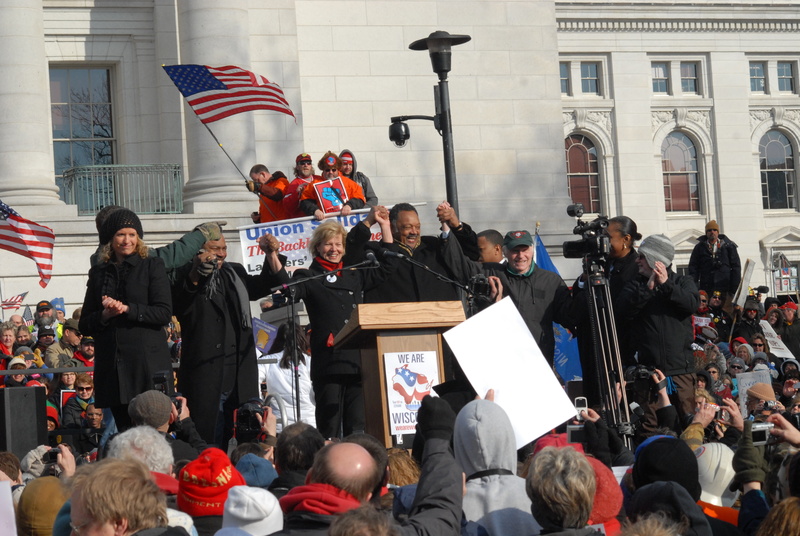 Wisconsin Democratic State Representatives are unified. 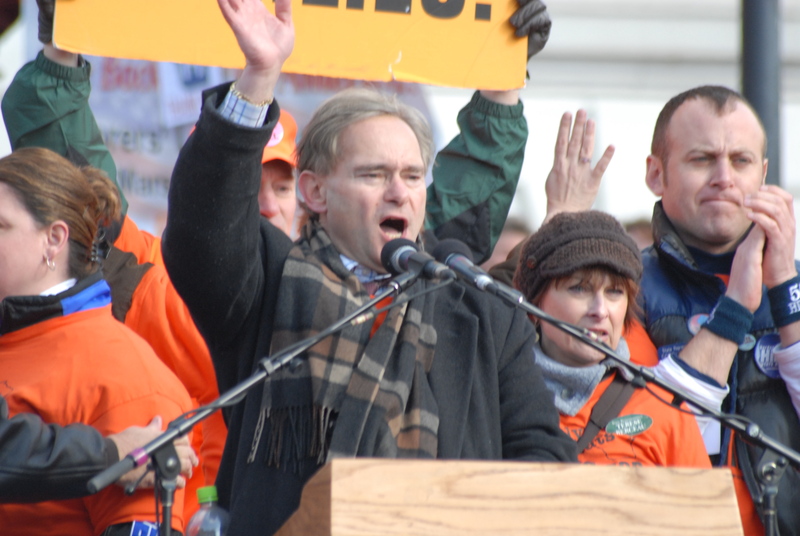 “We trade in our rally signs for clipboards and we recall the Republican senators and recall the Reublican governor who would not listen to us!” shouted Democratic Senator Chris Larson of Milwaukee. 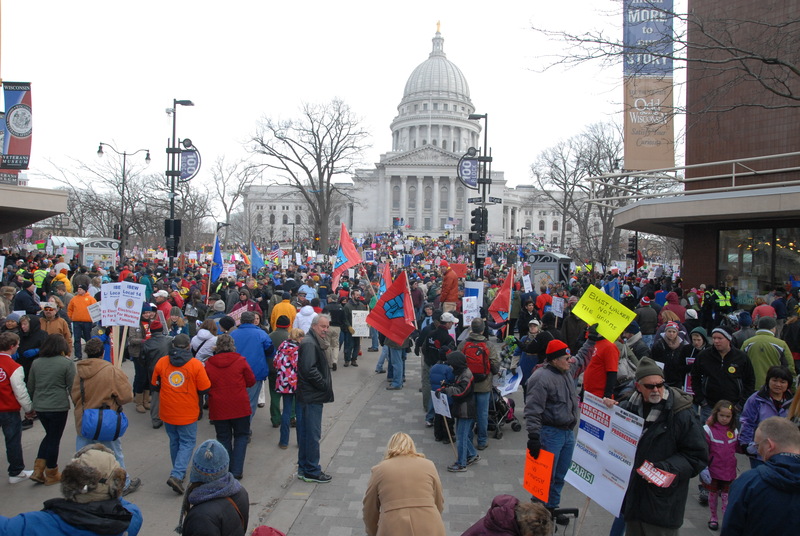 “The Koch Brothers can’t print enough money to stop us,” promised Senator Tim Cullen, Democrat from Janesville. 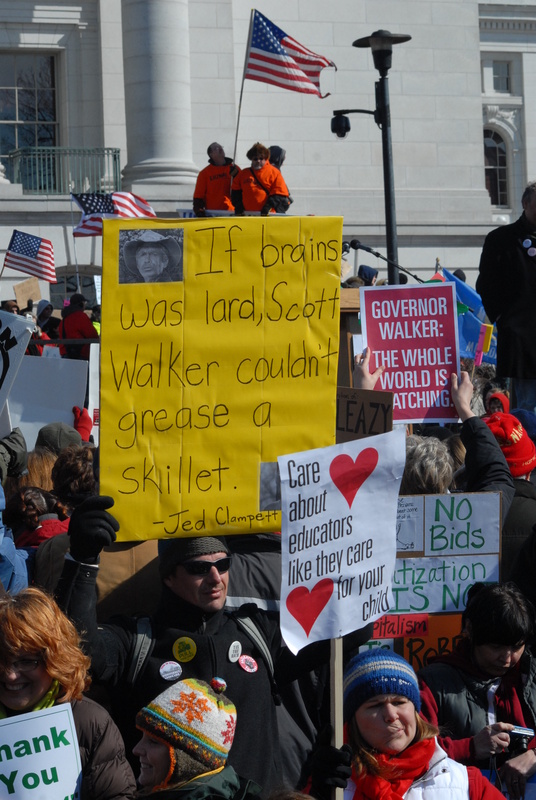 “Thank you to all the Slobs here in Wisconsin…” said Senator Tim Carpenter, Democrat from Milwaukee. 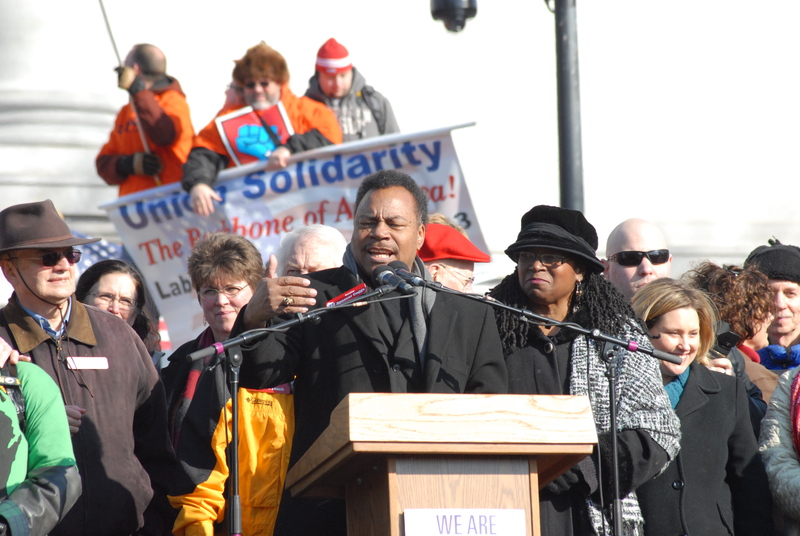 "...140 million in tax breaks to corporations--where are the jobs?" 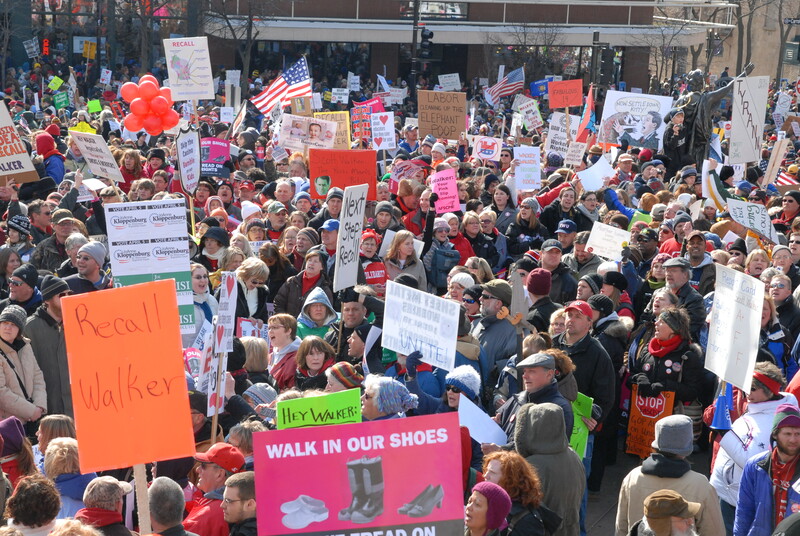 “We’re going to move forward and vote. This is phase 2. 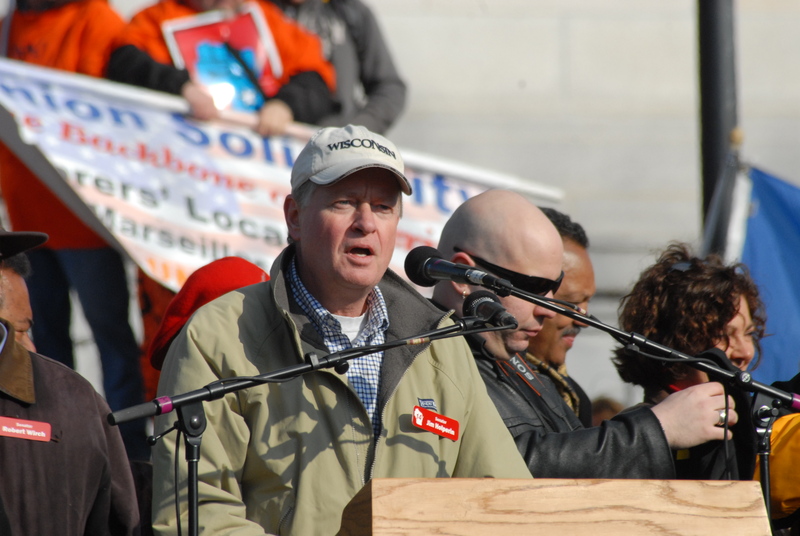 Phase 2,” said Democratic Senator Fred Risser from Madison. 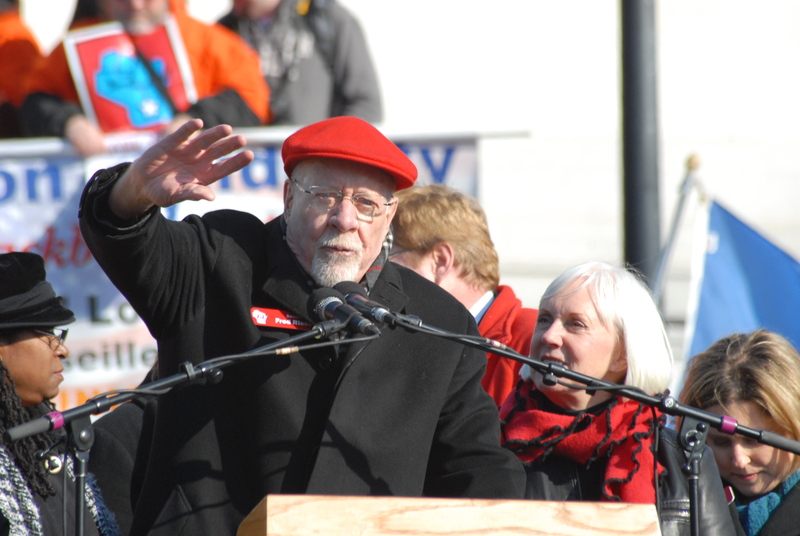 Risser is the longest serving state legislator in American political history. 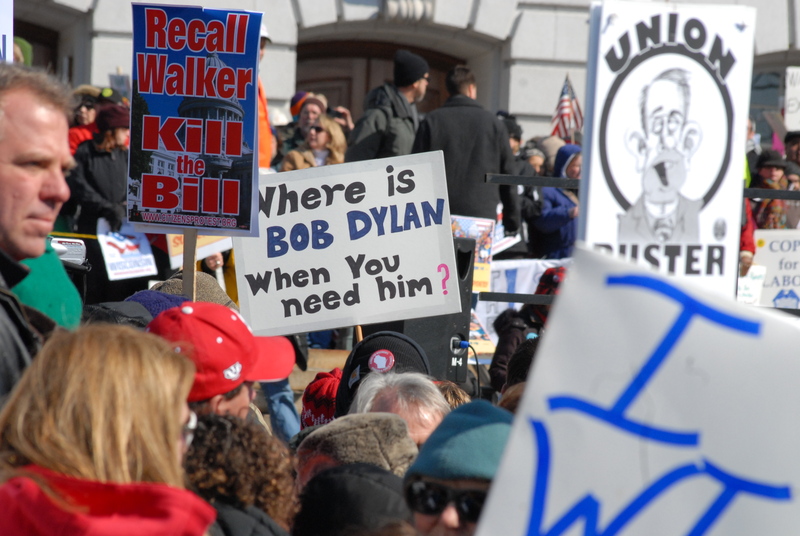 “In the church, a choir director told me he can’t sing because ‘Walker has taken away my voice, ’” said the Democrat from Alma, Senator Kathleen Vinehout. “No one can take away your voice! 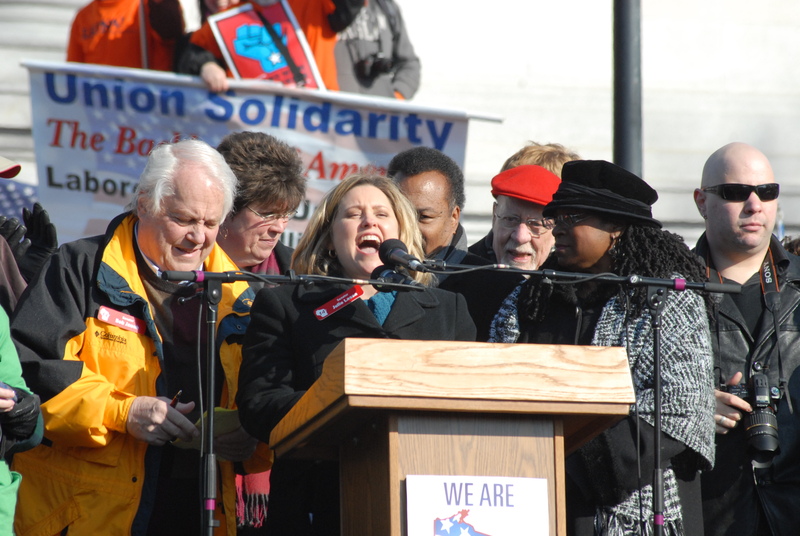 I want you to lift up your voice!” And the crowd made some noise. 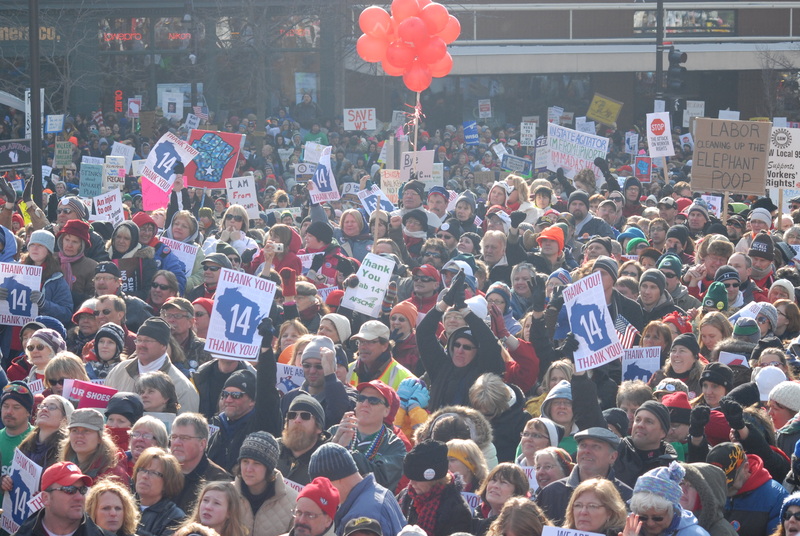 The crowd exploded over the return of the Wisconsin 14 last Saturday in Madison. 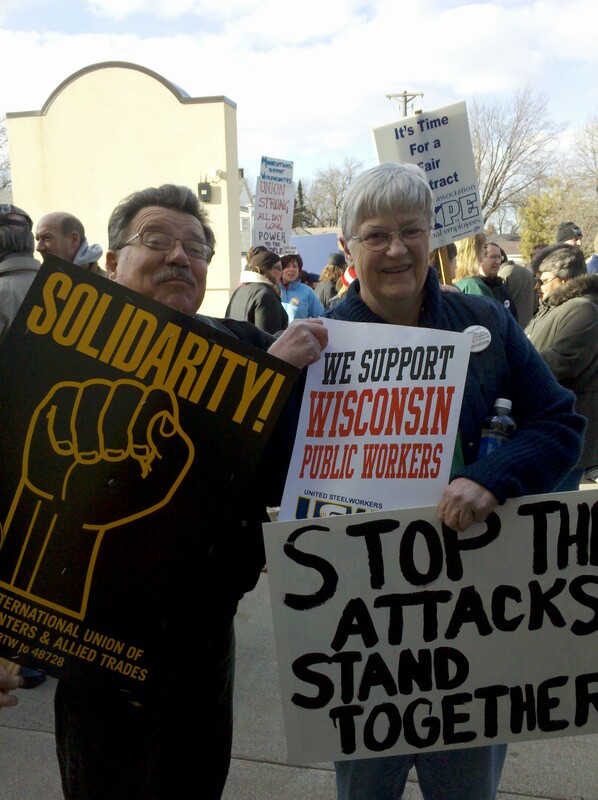 Two Wisconsin working women passionately and proudly held their “Thank you! 14 Thank you!” signs. 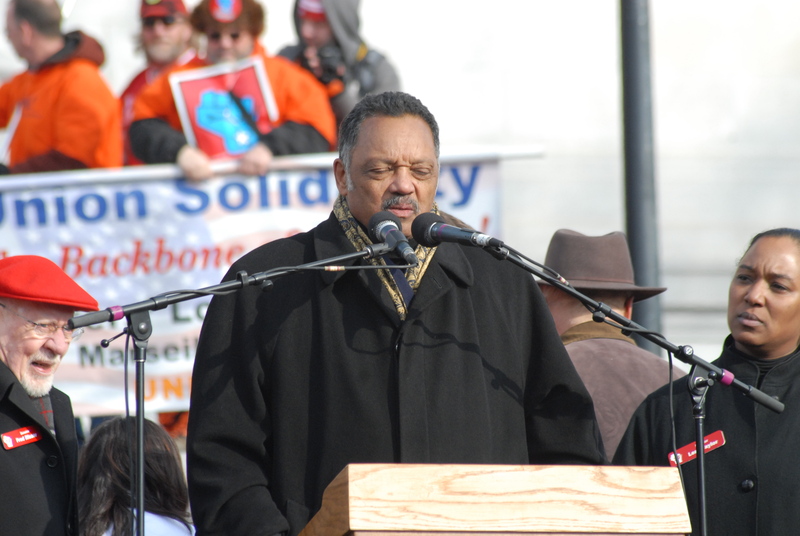 The Reverend Jesse Jackson led the rally in a prayer for earthquake-ravished Japan and working families in the class warfare struggle. 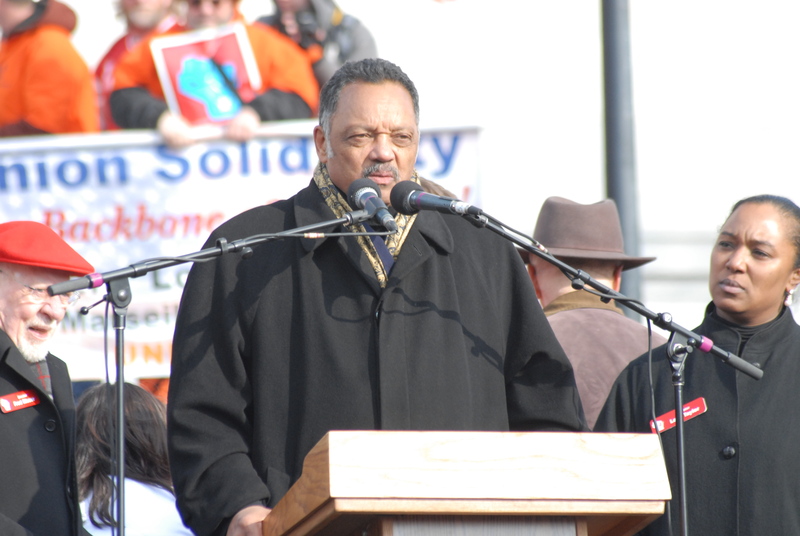 The Reverend Jesse Jackson moves through the crowd on his way to the podium with the Fab 14. 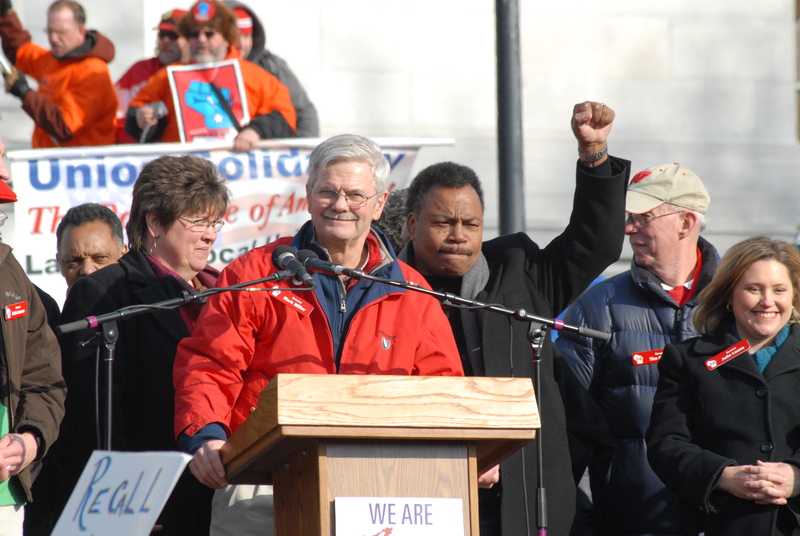 Reverend Jesse Jackson in unity with the Wisconsin 14 Democratic State Senators! “This is completely overwhelming! 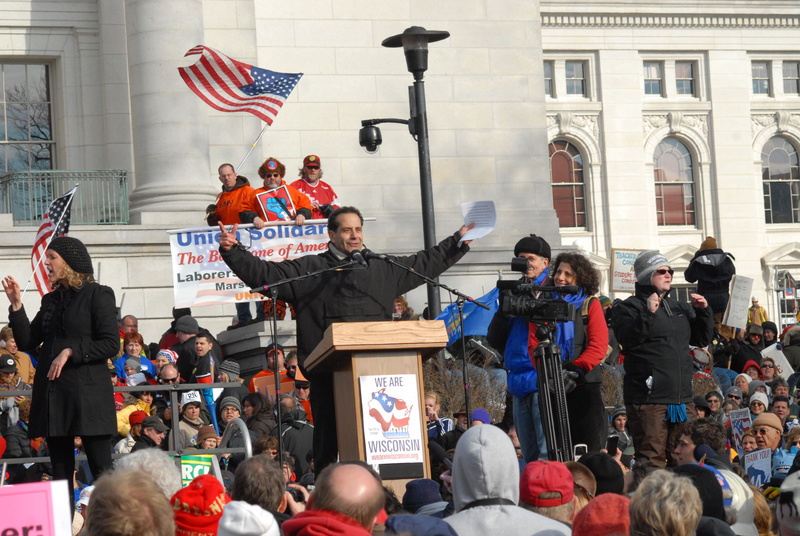 What an incredible privilege to be standing in the footsteps of the Wisconsin 14,” Monk Star and Wisconsinite Tony Shalhoub humbly remarked at the We Are Wisconsin Rally in Madison on Saturday. 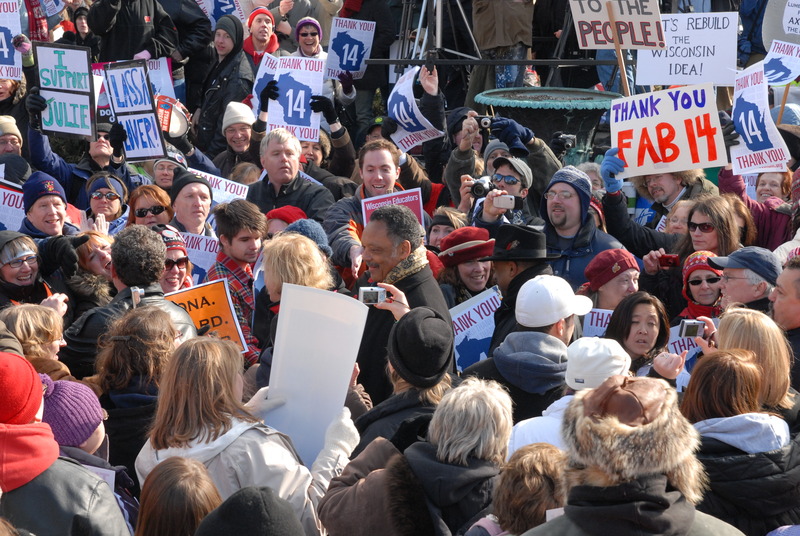 “They are what democracy looks like,” he chanted to the crowd. 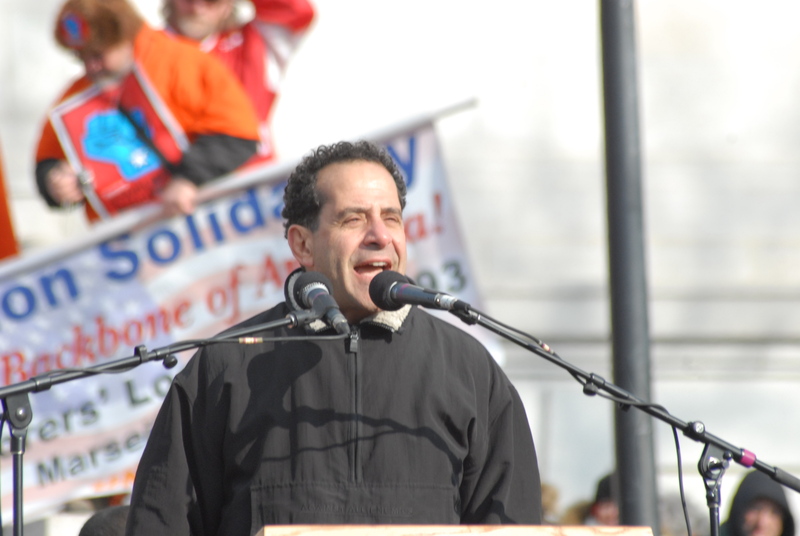 "...This is the beginning of a national movement..."
Tony Shalhoub's sister is a teacher from Green Bay. 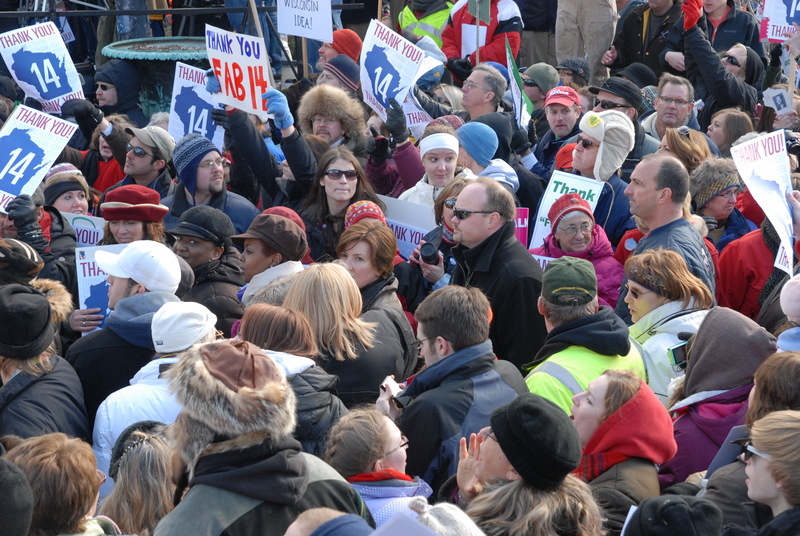 The crowd just after the tractorcade parade on Saturday. 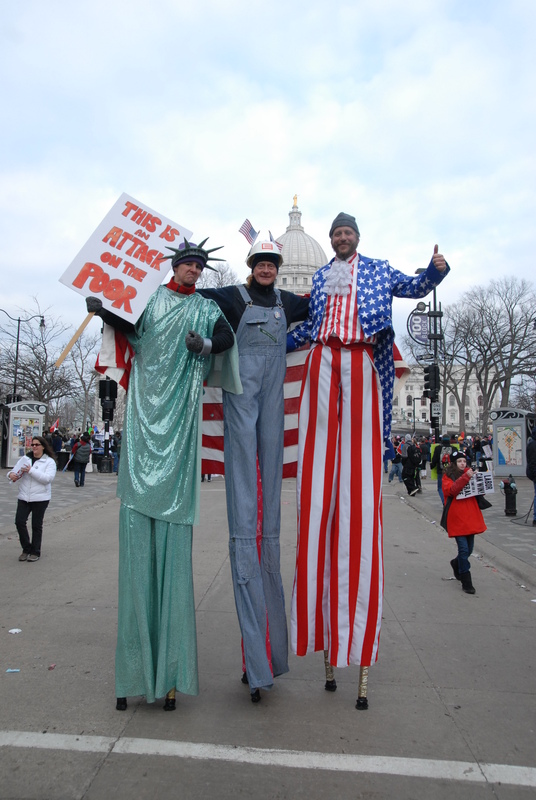 Stilt walkers NOT Scott Walker! 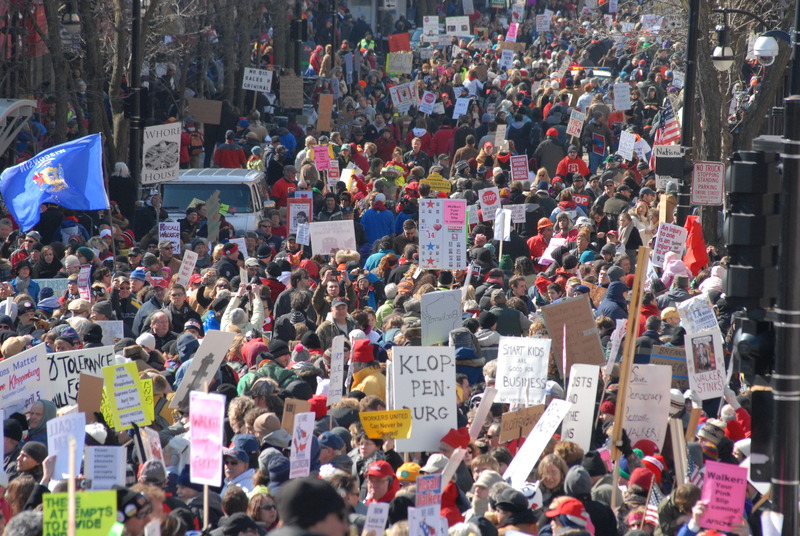 The 100,000+ crowd exploded over the arrival of the Wisconsin 14, a.ka. the Fab 14. 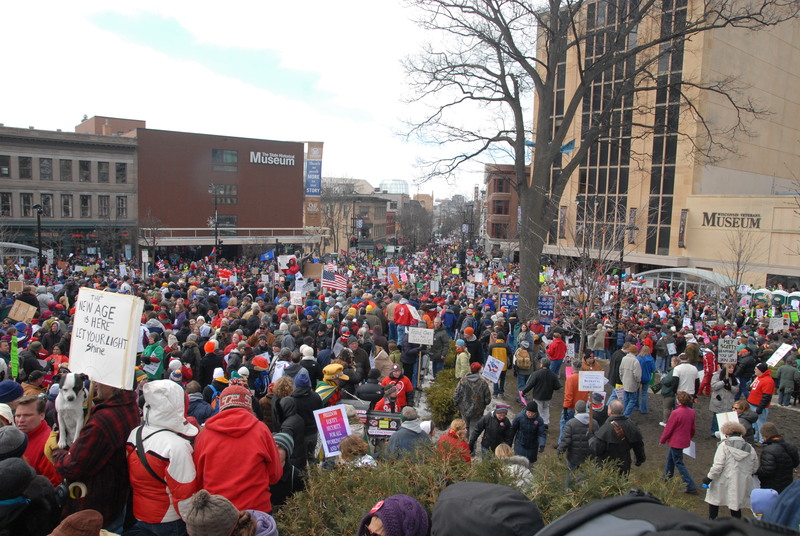 Huge crowd moves during break in rally action. 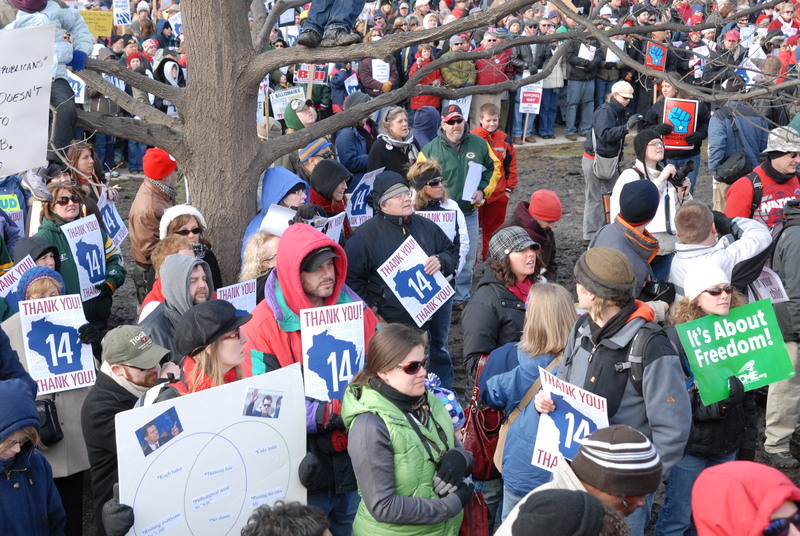 The crowd was thick and friends were made during slow shuffles.